St. Louis, February 22, 2016 – KellyMitchell Group, Inc. (KellyMitchell), a national IT Staffing, Workforce Solutions and Consulting firm announced it has earned Inavero’s 2016 Best of Staffing® Client Award. 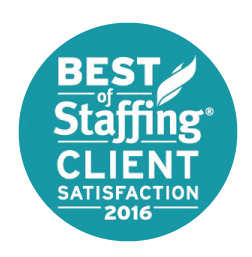 Presented in partnership with CareerBuilder, the 2016 Best of Staffing® Award is earned by fewer than 2 percent of all staffing agencies in the U.S. and Canada for service excellence. The survey, whose results determines the award recipients and is completed by client partners, is based on the Net Promoter Score (NPS) methodology. The process showcases how the winning firms truly stand out from the rest by separating significant service quality scores. “We are honored to be recognized by our clients for our service delivery and to be ranked among the top vendors in our industry. Our goal as an organization is to provide unparalleled service to our client and consultant partners each and every day, and we are very proud and humbled by this distinction,” commented Cassandra Sanford, CEO of KellyMitchell. Inavero administers more staffing agency client and talent satisfaction surveys than any other firm in the world. Inavero’s team reports on over 1.2 million satisfaction surveys from staffing agency clients and talent each year, and the company serves as the American Staffing Association’s exclusive satisfaction survey partner.